Swinomish Channel is the well travel waterway that connects northern Skagit Bay to Padilla Bay. Take your time, be aware of the currents, tides, and shoaling in the channel and you’ll be rewarded with a stay in the charming town of La Conner. La Conner Marina, marine stores and services, museums, specialty shops and galleries attract boaters and other visitors year round. From the north end of the Channel, it is a short cruise into Anacortes. This friendly city is a center for tourist facilities, restaurants, retail stores and all things boating. Cap Sante Marina is conveniently located in the heart of downtown Anacortes. Among the unique downtown shops is Marine Supply and Hardware Co., the oldest marine supplier operating on the west coast and purveyor of interesting items like antique portholes and a full sized replica deep-sea divers helmet. From Cap Sante Marine in Fidalgo Bay to Lovric's Sea-Craft on Guemes Channel to Skyline Marine Center in Flounder Bay, the Anacortes waterfront offers boatyard services of all kinds. Bellingham is the next port of call. Moorage is available at two Port sites, Squalicum Harbor near downtown Bellingham and Fairhaven Moorage in the historic district. Marine-oriented businesses and services line the waterfront along with lodging, dining, and retail establishments. LFS Marine & Outdoor is a favorite for boating and marine supplies, clothing and gifts, safety gear, charts and more. 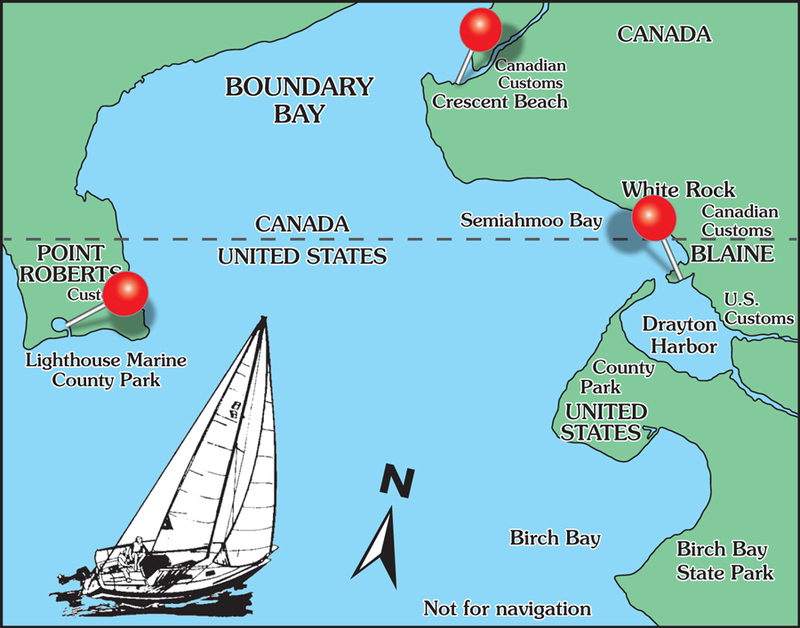 Those cruising on northward will find that Point Roberts and Blaine are the last U.S. ports before crossing the US/Canadian border. Both are US Customs and Border Protection designated ports of entry. If you visit Blaine Harbor during the summer, ride the historic M/V Plover, the state’s oldest foot-ferry, from the harbor over to Semiahmoo Spit Park. A stop at Point Roberts Marina Resort isn't complete without a walk along the beach at Lighthouse Marine Park to enjoy panoramic views of Mount Baker, the Cascade Mountains, the San Juan Islands and Vancouver Island. Crossing into beautiful British Columbia, Crescent Beach Marina is also a Customs Port of Entry.